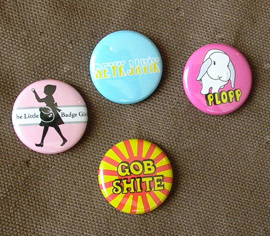 The Little Badge Girl features original artwork by graphic designer migimatronica. Our badges are 1" in diameter and are made of the highest quality materials made in the USA. You can browse and select from our gallery, or provide your own artwork for a custom pressed run. Copyright ©2006 The Little Badge Girl All Rights Reserved.